J.D. 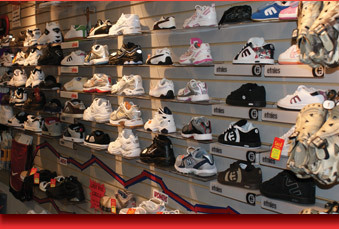 Sport features brand name footwear for all of the games you play. We sell running shoes from Saucony and Avia. We have cleats for football, baseball, soccer and field hockey including Reebok, Puma and Zephz. Our casual shoe line features Etnies and Converse “Chuck Taylors.” We also have cheerleading footwear from Nike, Reebok, Converse and Zephz. Stop by and check out our selection.